AIMEZO stand behind our brand and the quality of the products we sell .We have decades of experience in manufacturing height adjustable desk and adjustable desk accessories.we has a strong design, research and development team, with a number of products independent patents, adhere to the "green, healthy and comfortable" design concept to provide customers highest cost-effective lift desk series products and the most perfect after-sale service. AIMEZO is the perfect choice to your standing desk station, allowing you to find that much needed healthy balance of sitting and standing throughout the long work day. 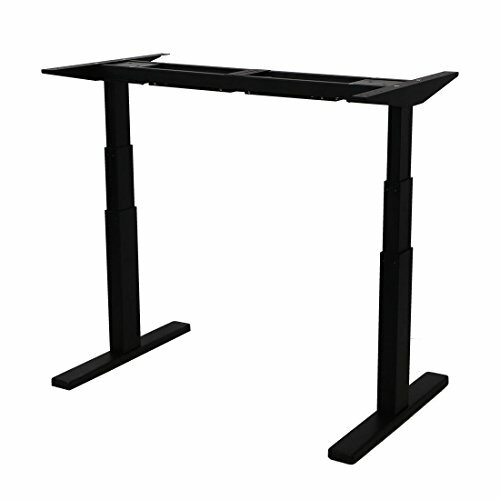 AIM02E001 is double-motor electric height adjustable desk frame only and requires a separate purchase of a tabletop with a recommended length of 47" to 78.7", width of 23.6" to 31.5", and a thickness of 3/4" and greater.3-Stage Lifting Columns for More Height Range & Load Capacity ; 2 Motors for fast, smooth, even height adjustment Construction meets ANSI/BIFMA/UL/EN527/FCC standards for safety and performance/ High quality with 5 year frame and 2 year motor warranty. • All steel construction and a thick leg support system with a load capacity of 220 lbs. Fits top table:length of 47.2" to 78.7", width of 23.6 to 31.5"
Solid Steel Construction: double steel tubing construction for maximum structural integrity. Crossbar and adjustable feet pads offer extra stability. If you have any questions about this product by AIMEZO, contact us by completing and submitting the form below. If you are looking for a specif part number, please include it with your message.